Here are 6 rules of writing from George Orwell, the master of clear, concise writing. If you have a chance check out his essay Politics of the English Language; timeless words for writers of any age. There is a link at the end of the article. 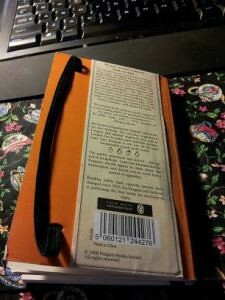 I realized today that I wrote a post about George Orwell’s Diaries (Horror interrupted by gardening, 26 July 2012) and neglected to mention or display one of my favorite notebooks, the Penguin Books Nineteen Eighty-Four notebook. 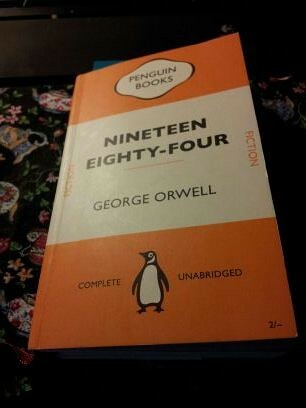 I have since read all of George Orwell’s novels and even though Animal Farm is standard issue and required study in most high schools in Canada, I think 1984 is far superior. And to be honest, Keep the Asphidistra Flying is even better. 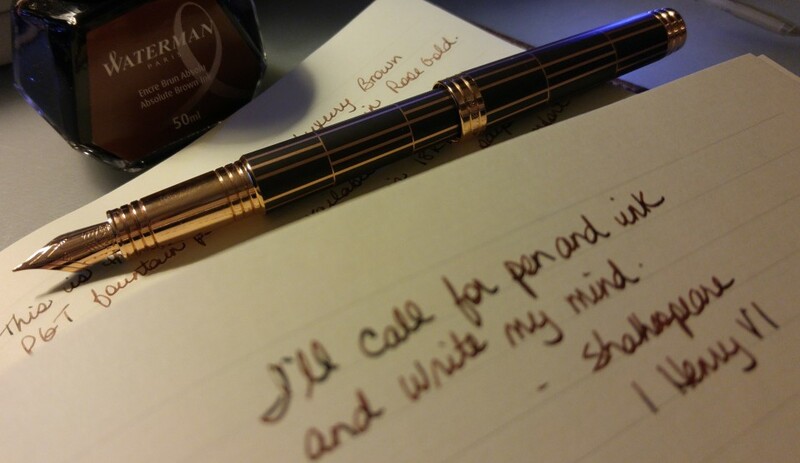 Anyway, I was and am still delighted with this notebook. I love the vintage Penguin cover. 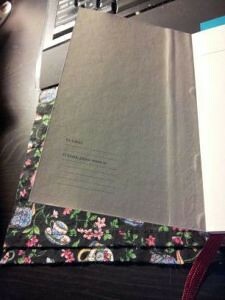 I was hoping for some quotes from the novel but it is a blank book, essentially. Here is the opposite page. I must have taken a dozen shots of this page; this one is the least blurry. Oh and the post-it markers are my own. The paper is thin, feels a lot like newsprint. Both sides are lined. For me the best bit is the back cover. Not too much to ask, is it? It was in 1935 that Allen Lane, Managing Director of Bodley Head Publishers, stood on a platform at Exeter railway station looking for something good to read on his journey back to London. His choice was limited to popular magazines and poor-quality paperbacks – the same choice faced every day by the vast majority of readers, few of whom could afford hardbacks. Lane’s disappointment and subsequent anger at the range of books generally available led him to found a company – and change the world. “We believed in the existence in this country of a vast reading public for intelligent books at a low price, and staked everything on it.” Sir Allen Lane, 1902 – 1970, founder of Penguin Books. He wanted a “dignified but flippant” symbol for his new business. His secretary suggested a Penguin and another employee was sent to London Zoo to make some sketches. Seventy years later Penguin is still one of the most recognizable brands in the world. The quality paperback had arrived – and not just in bookstores. Lane was adamant that his Penguins should appear in chain stores and tobacconists, and should cost no more than a packet of cigarettes. Reading habits (and cigarette prices) have changed since 1935, but Penguin still believes in publishing the best books for everyone to enjoy. I was very excited to find this review in Publishers Weekly, week of May 21, 2012. George Orwell is one of my heroes. His clean prose is an inspiration and his wit and spirit a tonic in the madness of the world today. I own and have read bits of The Collected Essays, Journalism and Letters of George Orwell, Volumes 1 through 4, and they are worthwhile study for any writer. Here is the review by David Brooks. George Orwell has become a literary saint because of his moral commitment and intellectual honesty. In his diaries, edited by Davison (co-editor of Orwell’s Complete Works), you see those two virtues coming into formation. 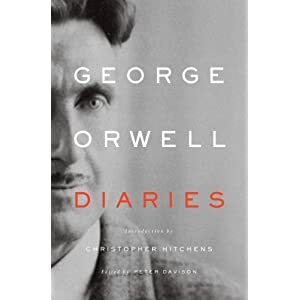 In the early part of his career, Orwell spent much of his time living down and out with the poor, recording their habits and conversations, and his own efforts to stay nourished and alive. Orwell made judgments to himself, and his tone could be especially nasty when a Jew did something he disapproved of. But in general he is not in a judging mode, and he is certainly not describing his inner feelings. 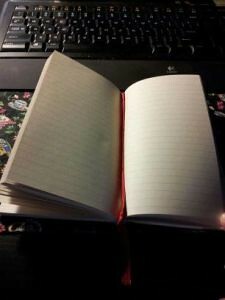 He often simply notes things: how much dried milk poor mothers get, how much beer they serve their children, what coffee shops allow tramps to sit undisturbed. The diaries are not always scintillating reading. Orwell’s journal entries can be described as horror interrupted by gardening. For long stretches, he simply records the weather, how the beans are coming in, how much weeding he did. But when times got hard, his pen came alive – in the 1930s with the poor, in the early 1940s during the war, and in the late 1940s, as he grew ill. The characteristic Orwell voice is there – the intense clarity, the obsessive need to get some sort of honest rendering of reality. This book is not for beginners. 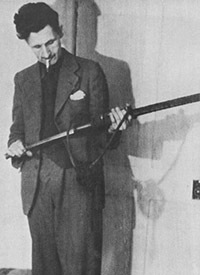 It is for Orwell aficionados who already know the man’s life. Christopher Hitchens (Why Orwell Matters), who followed so faithfully and well in his footsteps, provides a fine introduction. 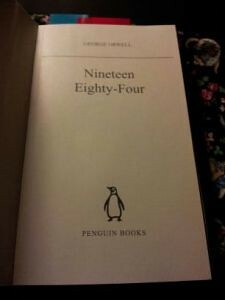 Despite the longeurs, it is a pleasure to be around Orwell’s mind and his perfectly clear prose style.